With more than 12 points of articulation, these action figures are the most highly detailed and articulated Turtle figures ever made!Each figure comes with their signature weapons. Please search code 125411 to check stock availability in our stores. Raphael is the hot head of the Ninja Turtles and enemies should be wary of his expertise with sharp sai swords. 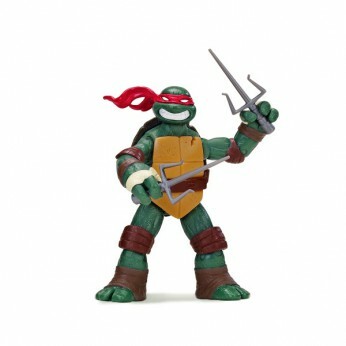 This Raphael action figure is great for imaginative play and recreating episodes from the popular TV series. Turtle Power! Highly detailed Ninja Turtle figure; Complete with signature weapons; Collect all 4 Turtles and all the other characters from the show. Compatible with other Teenage Mutant Ninja Turtles playsets. One supplied; For ages 4 years and over; EAN: 43377905042. WARNING(S): Not suitable for children under 3 years old. Only for domestic use; To be used under the direct supervision of an adult. This toy costs approximately £7.99 (for the latest and best prices make sure you check our retailer list for the Turtles Action Figure Raphael above). In our review of Turtles Action Figure Raphael we classed it as being suitable for ages 3 years, 4 years, 5 years but recommend you check the manufacturer specific advice before purchasing.